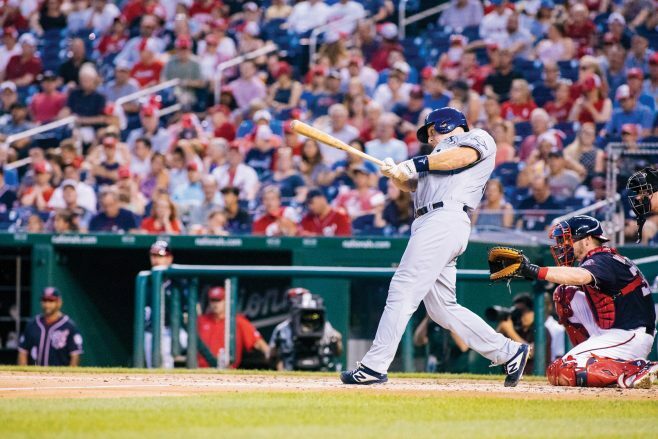 Milwaukee Brewers catcher Erik Kratz ’02 homers in his first at-bat of the Aug. 31 game against the Washington Nationals. ONLY ONE BASEBALL TEAM ends their season with a “W,” and in 2018, it wasn’t the Milwaukee Brewers. But catcher Erik Kratz ’02, who has weathered the ups and downs of many Ws and Ls (in baseball parlance, wins and losses) in his 17 seasons of professional baseball since graduating from EMU, would chalk up a W for this last one just the same. Besides setting a career-best season in several statistical categories including starts, Kratz also made baseball history: He is the oldest player (since 39-year-old A’s third baseman Lave Cross in 1905) to make a postseason debut and the second- oldest catcher in postseason history with three hits in a game. Kratz could teach a class in negotiation, contracts and plain old life logistics of being a pro player: he has played for 30 minor league teams and experienced just about every type of transaction possible in the business – trades, releases, purchases, claims off waivers, and free agency. 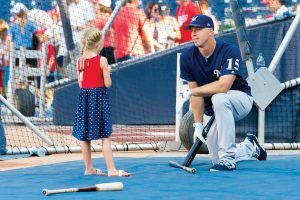 Kratz visits with a young fan during pre-game batting practice. The media, both midwestern and national, was quick to catch onto Kratz’s unique feel-good story – one many of his true fans have followed for a long time. “A true baseball lifer is getting his shot on the big stage, and hasn’t disappointed,” wrote SB [Sports Blogging] Nation. Kratz’s “journeyman” story was re-told by broadcast announcers in each game he played. The attention didn’t just come from where he’d been or what he did on the game’s biggest stage; it was also on how he played the game, with focus and passion and integrity. Certainly his division series Game 2 and 3 contributions, during which he provided a key 2-run single and then went 3-for-4, helped to catch the collective baseball world’s attention. Then Kratz, wearing a microphone, provided an unforgettable soundtrack to Game 7’s last out. After watching the catch, before celebrating the biggest win of his long professional career, he turned around to thank and bless home plate umpire Teddy Barrett. In an already memorable season, Kratz played one of his two final games in front of a special crowd. Nicknamed the Kratz Krew by the media, 14 EMU-linked buddies* now living around the country rendezvoused in Milwaukee’s Miller Stadium for a crucial Game 6, somehow keeping their plan a secret until pre-game, when Kratz found them in the front row seats on the first base line, wearing former team jerseys raided from his closet, smiling and waving and near tears with joy at seeing their friend on the field, just two wins away from the World Series. It didn’t happen, but “October’s Unlikely Hero” (Baseball America) isn’t done yet, and MLB’s “Best Story in Postseason Baseball” isn’t over yet. We’ll be watching, Erik Kratz.